If I said that preserving our existing nuclear power plant fleet should be a top 5 American priority, you would think I was crazy. Next to jobs, the economy, terrorism and national security, something so mundane would pale in comparison, right? But nuclear energy is interwoven with those top priorities. Here’s the pitch: our 99 nuclear reactors support a massive ecosystem that is critical to all of these issues – especially national security. Russia and China understand this in a way the Obama administration didn’t seem to. They are taking this industry away from us by methodically expanding nuclear in their own country and worldwide. There are 66 reactors being built today in 16 countries. Of those 66, China and Russia are building, or partnering in the building of, 52 of them. Even though we still hold a lot of the intellectual property in the industry, others are harnessing the jobs and investment dollars, not us. In the U.S. alone, with only four units under construction, nuclear energy is a $60 billion industry. The jobs for both existing plants and new builds are technical and highly paid. This is the type of heavy industry that it seems the Trump administration is gunning for. America is going in the opposite direction. Our fleet is aging, over-regulated, and headed for eventual extinction under the current conditions. The nuclear energy industry was born out of our WWII nuclear weapons program at what are now Los Alamos, Oak Ridge and Pacific Northwest national laboratories. Nuclear for energy and nuclear for national defense have been tied together ever since. There are a bunch of overlaps which will not change. Historically, having a strong domestic nuclear industry meant that we had a healthy supply chain for military applications, such as reactors for aircraft carriers and disposing of weapons grade plutonium. The international regulatory regimes for nuclear plant safety were all based heavily on the United States. The Nuclear Regulatory Commission’s only mission is safety (not growth, as outlined in a previous blog), and they are the gold standard for the rest of the world. But, if the nuclear fleet declines, so do fees paid to the NRC. Our international influence declines. Suppliers for the military are affected. Attracting talent to to a very sophisticated industry becomes more difficult. Nobody wins with a downward slide. With a steady stream of nuclear plant closings, the U.S. Navy would struggle. Jobs. Most Navy nuclear workers want to use their expertise when they leave the service. 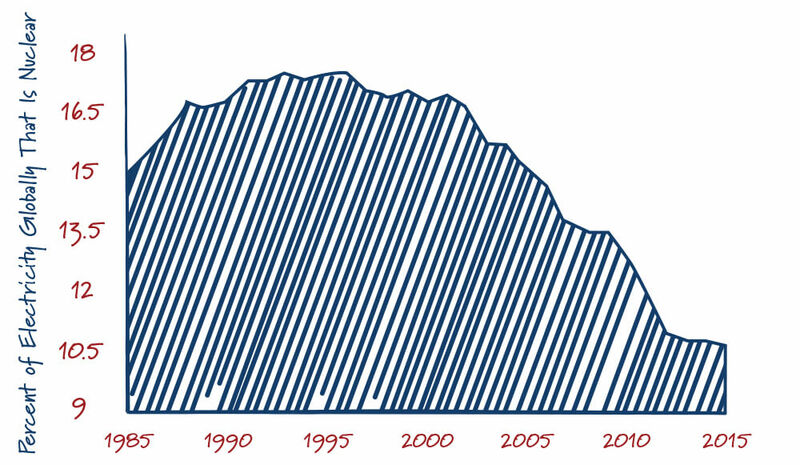 Fewer nuclear plants means fewer post-Navy jobs and fewer applicants for Navy Nuclear Service. Nuclear research facilities and advanced test reactors that are crucial to the safe, long-term operation of the naval fleet. If the overall market for nuclear declines, companies are forced to downsize, economies of scale decline, there is less investment in R&D, etc. A rising tide raises all ships- including the Navy’s. China and Russia are consolidating their nuclear influence by offering the design, construction, financing and operation of nuclear plants for developing nations. I don’t know about you, but Russia supplying Iran’s nuclear industry makes me nervous. 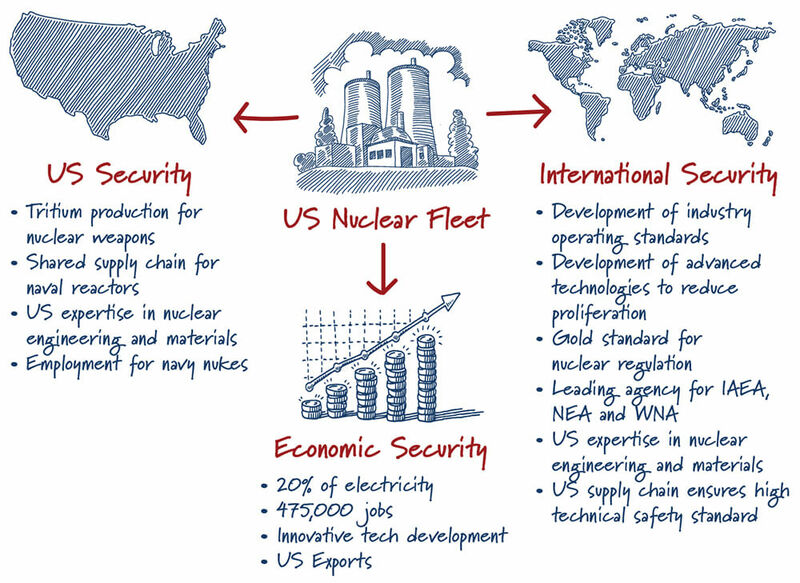 A robust civilian nuclear fleet is the solution, that keeps America in control, and thus keeps the world secure. Tritium (a radioactive isotope) – The Tennessee Valley Authority’s Watts Bar nuclear reactor produces the majority of tritium that we use for hydrogen weapons. International Licensing – Our Nuclear Regulatory Commission is the gold standard for global nuclear fleet safety, meaning we lead international licensing efforts. Their funding comes in the form of existing plants. No plants, no fees. Controlling Supply Chains – The more supply chains based here, the greater control we have over keeping nuclear technologies out of the hands of Iran and North Korea. We can exert influence on U.S. suppliers, but not Russia’s. Last summer I visited Vogtle 3 & 4 – two new nuclear reactors that Southern Company is building. About 5,000 workers are employed for the construction. However, many of the really complicated industry functions were being performed by foreign companies and even workers. The great industrial build out of the 50’s and 60’s is no longer. The heavy industrial capability, and massive job creation, in this country has atrophied. 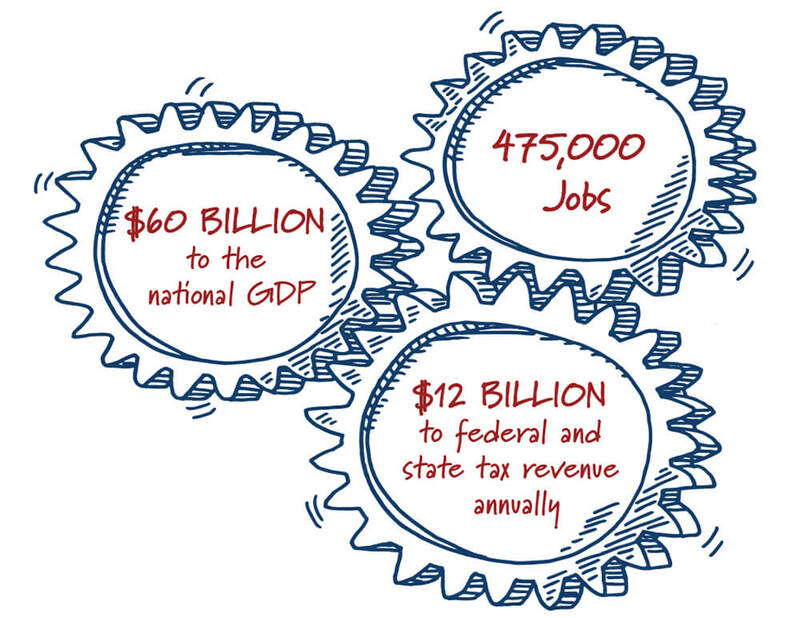 We’ve lost jobs and a smaller industry and supply chain means higher costs for everyone. With interest rates still low, I agree with the Trump administration that we need to bring this back. 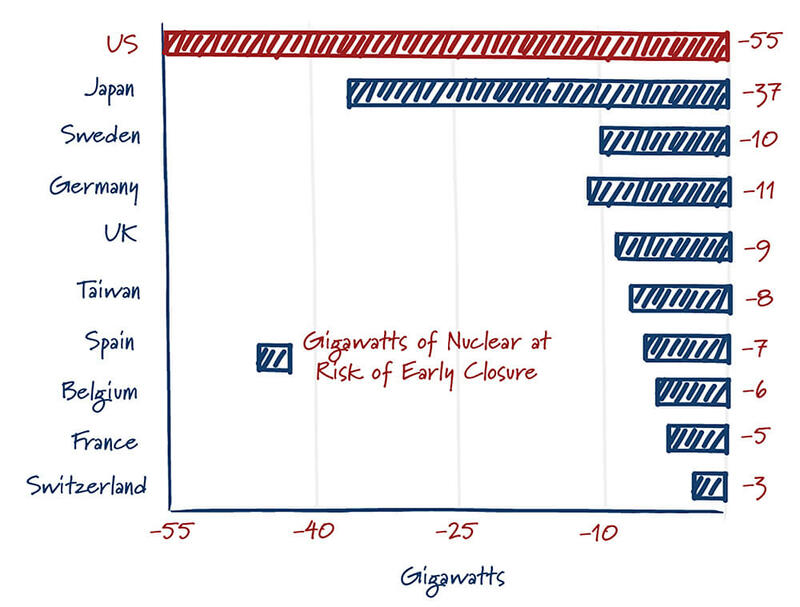 Now is a good time to rebuild infrastructure – and nuclear should be at the top of the list. Government has a role to play as policy drives our energy systems. You can check out our nuclear policy section to see some of the ideas we have. Vision and prioritization would be a good start that goes a long way. Strengthening our nuclear fleet would boost our economy and our national security.